The International Institute for Communication and Development, IICD, organised a workshop bringing togather experts in tanzania with various skills in ICTs for a 2 day workshop in Dar es salaam. The group which agreed to be called ICTfundi (fundi is swahili word which means one who repairs things). 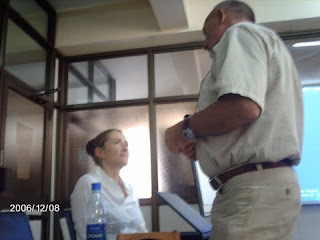 Bernadette Huizinga, IICD officer, in the background. She guides the group on the way towards working togather to bring better ICT services to the region. Some of the experts very attentive to understand how they can bring their rich experience towards making ICT services easily available. 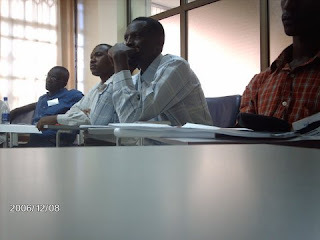 From Left to right, Andrew (NPK technologies), Dogan Gusera (University computing centre), Mark Farahani (kilosa telecentre) and John Kibuuka (fadeco telecentre).